A member of the Wahama White Falcons Marching Band gets in the holiday spirit during one of last year’s Christmas parades. BEND AREA — Christmas activities in the Bend Area have been finalized and will include a mixture of both old and new traditions. New Haven will be having its longtime craft show, with a few new twists, as well as a parade and visit with Santa. Mason will also keep its long standing parade and Santa visit events, but will add something new at the Stewart-Johnson V.F.W./Lottie Jenks Memorial Park. Celebrations begin Dec. 1 in New Haven with the annual New Haven Fire Department Ladies Auxiliary Christmas Craft Show, beginning at 10 a.m. in the fire station. It will continue until 3 p.m., according to Shelby Duncan, organizer. Duncan said there will be some new vendors at the show, as well as some who will be back for their 17th or 18th year. Wreaths, jewelry, candles, ceramics, food items, and socks and other items made from Alpaca wool will be among the vendor offerings. The auxiliary will also be selling its famous dish cloths, Duncan added. Members have sold over 300 dozen of the cloths in just the past few years. They will also be offering tacos in a bag, barbecues, hotdogs, chips and drinks from the fire station kitchen, and will give away door prizes throughout the day. The New Haven parade will begin at 11 a.m. that day. Following the parade, Santa will visit with the children at the fire station. New this year, children are invited to bring their letters to Santa to present to him in person, and also bring a food item that will be donated to the Bend Area Food Pantry. Parade entries can then journey on down the road for the Mason parade, which will begin at noon. Following the parade, Santa will be giving out treats and small gifts at the town hall. For the second year, both the New Haven and Mason parades will include entries from local churches. Under the direction of Pastor Donnie Dye of the Fairview Bible Church, the church entries will depict the life of Jesus Christ. The new events at the Stewart-Johnson V.F.W./Lottie Jenks Memorial Park in Mason will include over 20 decorated and lighted trees that families, businesses or groups have erected. Beginning Dec. 1, the trees will start going up in the park. They can be in honor or memory of someone, with those putting the trees up in charge of their own fresh or artificial tree, lights, extension cords and decorations. Then, on Dec. 15, a “Christmas Night in the Park” will be held. From 5 to 7 p.m., there will be free horse and carriage rides given by Rocky Point Farms of Kenna, WV. People will be able to view and vote for their favorite park tree, and free hot chocolate and cookies will be provided by the family of Councilwoman Sharon Kearns. According to Mayor Donna Dennis, while there will be no organized event for carolers, any group or individual is invited to show up that evening and sing Christmas tunes. 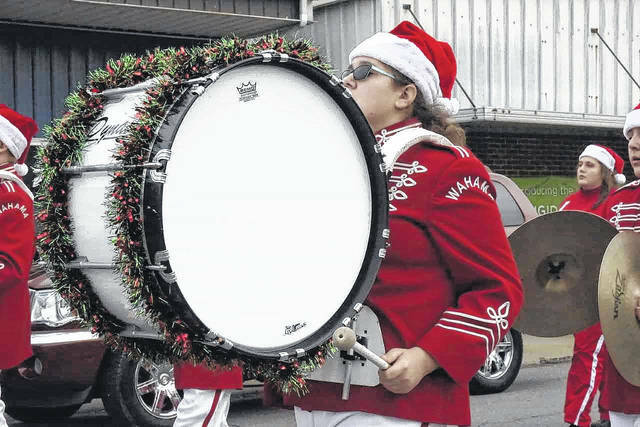 https://www.mydailyregister.com/wp-content/uploads/sites/24/2018/11/web1_12.5-NH-2.jpgA member of the Wahama White Falcons Marching Band gets in the holiday spirit during one of last year’s Christmas parades.